Last week I published a story that questioned the accuracy of Prime Minister Kevin Rudd’s Pecuniary Interest statements. This story focused predominantly on the Canberra (35 Mueller St, Yarralumla) and Noosa (“Ocean Blue”) properties that The Rudds own, not to mention the way that they were officially referenced by Mr Rudd, in accordance with Standing Resolutions on the Registration of Members Interests. These resolutions also govern the reporting of registrible interests of spouses and dependent children of politicians as well. Now since their purchase in 2010 and 2011 respectively, The Rudds have used these properties for both residential and investment purposes throughout the course of the 43rd Parliament. While “Ocean Blue” was disclosed as being an investment property by Mr Rudd in accordance with Section 3 of the Members Interests Register, the Yarralumla property wasn’t upon its switch to being a rental property (for approximately an 18 month period) and is listed solely in his name. Furthermore, the substantial rental income from both of these properties wasn’t disclosed as required under Section 10 of the register, while Therese Rein and Mr Rudd are listed as the Borrower and Guarantor respectivly for a loan with an undisclosed financial institution. This entry appeared to be on top of the loans that had previously been disclosed within the statement, prior to the conclusion of the 42nd Parliament. The Prime Minister’s statement of registrable interests is up to date and available online. When required the Prime Minister’s statement is updated in the usual way. Now given that pages 7 and 12 of Mr Rudd’s Pecuniary Interests still looked potentially troublesome, I decided to put this statement to the test by acutely analysing one of the properties involved. Within my personal possession are copies of the current certificates of Title and Land Title Transfer for 35 Mueller Street, Yarralumla. These documents were obtained via the Land Titles Public Register that is maintained by the ACT Office of Regulatory Services. For a fee, these documents are legally accessible over-the-counter by the general public and were certified as being correct by the Registrar-General, as of the 23rd of July, 2013. 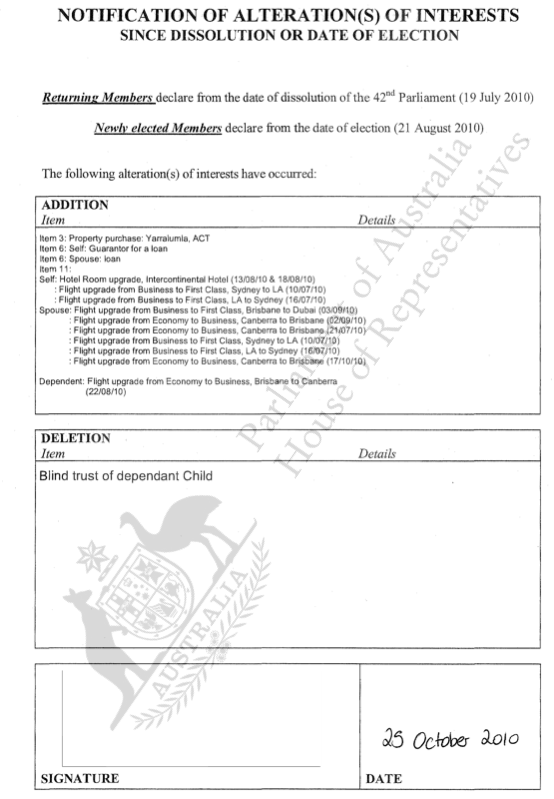 In contrast to page 7 of Mr Rudd’s Pecuniary Interests, these documents state that Ms. Rein is the current sole owner of 35 Mueller Street, Yarralumla. Furthermore, they also state that the property is mortgaged to the Commonwealth Bank of Australia, the settlement price and that the Agreement for Sale was reached on the 7th of September, 2010. Coincidentally, this was the same day that the agreement of Minority Government for the 43rd Parliament was reached. In association with this, the Yarralumla property was also recently removed from the market, after it had been listed for $2.25 million with Peter Blackshaw Real Estate in late May of this year. Now between Prime Minister Rudd’s Pecuniary Interests statement, the presence of undisclosed rental income off the Yarralumla and “Ocean Blue” properties and the aforementioned Land Title documents, it is evident that the statement that the Prime Minister’s office provided is incorrect. Needless to say, that could have some serious repurcussions for both The Rudds and the current Parliament going forward depending on how Mr Rudd handles these issues, given the current resolutions of the House of Representatives. Under the Resolution governing the registartion of Pecuniary Interests, Members of the House are required to provide information detailing real estate and the purpose for which it is owned, liabilities and whom the specific type of liability is with, as well as any other substantial sources of income. This is further reinforced by a further resolution stating that any Member who knowingly fails to notify the Registrar of any changes that have taken place to their interests within a 28 day period or knowingly provides false or misleading information, shall be guilty of a serious contempt of the House of Representatives and shall be dealt with by the House accordingly. Given that the Yarralumla property was used by The Rudds for both residential and rental purposes, while it is also influenced by the aforementioned resolutions, it will be interesting to see how Prime Minister Rudd answers the questions posed by this story, not to mention how it’ll influence the date of the upcoming election and the nation going forward. For Prime Minister Rudd’s most current Pecuniary Interests register entry, check out the Scribd document below or the Members Interests section of the House of Represenatives website.